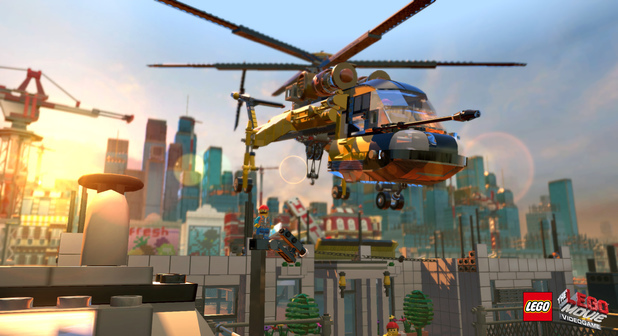 The Lego Movie Videogame is an action-adventure video game developed by TT Games. It is the latest in their series of Lego video games and is based on the animated film, The Lego Movie. The game was released by Warner Bros. Interactive Entertainment alongside the film in 2014 for Xbox 360, Xbox One, PlayStation 3, PlayStation 4, Wii U, Nintendo 3DS, PlayStation Vita and Microsoft Windows. Continuing the trend of gameplay from previous Lego titles by TT Games, the game puts players in control of various characters from the movie, making use of Lego pieces to make their way through several levels. For the first time in the series, environments are completely made out of Lego pieces. The game introduces two main new character types, Regular Builders, such as the protagonist, Emmet, and Master Builders, such as Vitruvius. Regular Builders are unable to normally construct objects out of piles of Lego pieces and instead require instruction pages that are found throughout each level. Using these, players follow the instructions to build objects with specific pieces. Master Builders, on the other hand, have the ability to grab Lego pieces from the environment and use them to create something new. Wikipedia®. Trainer for the beat ’em up game The Lego Movie Videogame, you can use it to activate these essential cheat Codes: Infinite Health, Mega Lego Studs. Note: This cheat tool is for the original version v1.0 of the game The Lego Movie Videogame.